Many people with ADHD are dealing with tremendous amounts of pain in their lives. But, this is normal, because life is a painful experience for most people on this planet. However, there are ways for people with ADHD to absorb the pain of life, no matter what you may be going through, and come out a better person after all is said and done. One of the best ways to accomplish this is through stoic philosophy. Stoic philosophy, or stoicism, is a system of thinking that was initially used in the Roman and Greek world around the 3rd century BC. 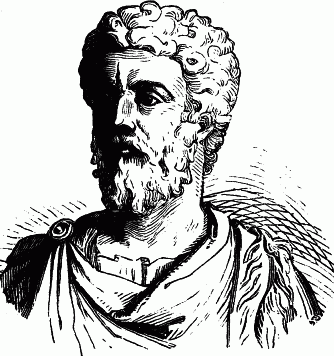 And, stoicism is best known because of Marcus Aurelius, who was the Emperor of Rome from 161 to 180 AD. One of the moral tenets of stoicism is that the human soul is part of a greater “interconnected” universe. The cosmos is a unity governed by an intelligence, and the human soul is a part of that divine intelligence and can therefore stand, if naked and alone, at least pure and undefiled, amid chaos and futility. This means that even during the worst of times, when you feel like you’re completely alone, there are still millions of other people facing similar struggles as you. All humans are connected, as we’re all a part of a greater universe. This quote, from the book Meditations (available for free), is one of the most powerful pieces of advice that people with ADHD can take away. Because, by focusing only on the things that you can control, you will drastically improve your quality of life. This is also commonly referred to as developing an internal locus of control. > When you believe that you mostly have control over your own life, then you have an internal locus of control. > When you believe that your life is mostly out of your control, then you have an external locus of control. If you’d like to “become the captain of your own ship” so to speak, then it’s best to work on developing an internal locus of control. People with ADHD frequently suffer from racing thoughts. Your mind might feel like it’s buzzing with anxious thoughts, painful memories, problems related to work, issues with your relationship, and similar life problems. So, it’s unbelievably important to take control of your thoughts to the best of your ability, and focus on the quality of your thoughts. The quality of your thoughts can take you to amazing places in life. Or very depressive, dangerous places. How can you control the quality of your thoughts? I personally don’t believe that ADHD medication is useful for controlling the quality of your thoughts. But, you can be the judge of whether ADHD medication helps or hurts you in this regard. Important: I want to emphasize that even if you have a difficult time controlling the amount of thoughts that race through your mind – you can still take control of the quality of your thoughts. Stay focused on the positive things that are going to happen in your life. Always think positively whenever possible. I frequently claim on this website that ADHD can be a major pain to deal with. But, the truth is that ADHD isn’t the worst thing in the world either. If you’re currently reading this website, there’s a good chance that you have it much better than you think you do. It’s easy to forget there are 4 billion people who don’t even have access to the internet. The odds of you being born in a Western nation with access to decent healthcare, internet, education, food, and water are outstandingly slim. And yet, you practically won the lottery, since you were born into a household that gave you access to all of these luxuries. Make sure to practice gratitude, and be happy with what you have every single day (because things could always be much worse). Don’t view yourself as a victim of ADHD, or any other obstacle that you might be facing. Instead, focus on the fact that there was a reason for you to be challenged by ADHD, and all other obstacles in your life. The reason why you’re faced with major challenges (like ADHD) is to make you a stronger, more resilient, and all-around better human being. Better yet, according to Marcus Aurelius, you should accept the hand that life has dealt you with complete love and happiness. But, you can obviously still work hard to improve your situation at the same time (while still loving yourself and others). Life is full of pain, obstacles, and uncertainty. But at the same time, life is beautiful, fun, and amazing. 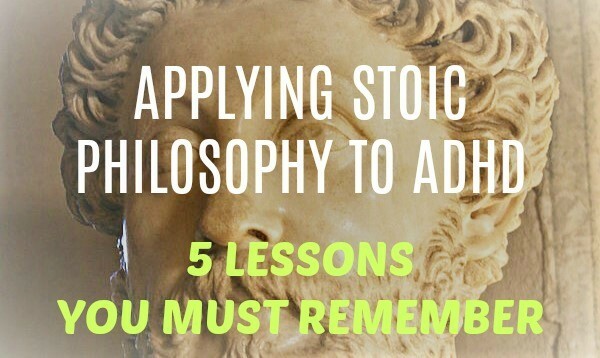 Studying stoic philosophy helps you absorb life’s pains, and make the most of life’s beautiful aspects. To learn more about stoic philosophy, I recommend reading the works of Marcus Aurelius and Seneca. And in case you haven’t noticed, the ADHD Boss website borrows a lot of inspiration from stoic philosophy as well. So, make sure to subscribe to my free e-mail list to receive uplifting messages (like this one) that help you live a better life with ADHD. YOU MADE MY WHOLE LIFE MAN!! been hatin’ on myself for havin’ ADHD but you made it LOADS better. Keep up the noble work you are doing and good luck to you always! Thank you so much Mahhayo. Comments like these make me feel happy. I truly wish you the best.